A Techne digital Gelation Timer provides accurate, reproducible results for manufacturers testing how long a sample or product needs to set from a liquid into a solid gel during polymerisation. With push-button operation, a bright LED display and the facility for mounting on a retort stand, the Gelation Timer could not be easier to use. When gelation occurs the digital timer stops automatically, indicated with an audible bleep and light. Two models are available: the 1rpm GT-5 shows times in one-minute increments up to 9999 minutes, while the 10rpm GT-6 version displays to the nearest tenth of a minute, making it ideal for materials with shorter gelation times. 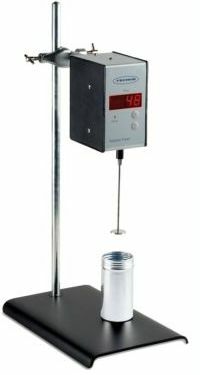 Techne Gelation Timers have led the market for almost sixty years and several British Standards for this methodology have been written with reference to Techne equipment. Available accessories include three sizes of stainless steel plunger (removable for easy cleaning), packs of disposable plungers, and sample cups. All Techne Gelation Timers are covered by a 3-year warranty and receive a calibration certificate for traceability.